Sometimes a new technology arrives that seems so amazingly obvious we feel like kicking ourselves that we didn't think of it first. 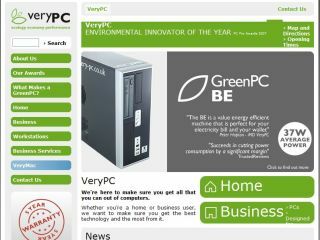 The new PecoBOO face detection tech, from the eco-friendly VeryPC guys is a classic example. The basic idea of PecoBOO is that it can tell whether or not you are looking at your computer screen and, if you are not, it will switch off your display. "A few months back we had a meeting to see what improvements we could make to energy savings in computer use. We asked, 'what if your computer could tell instantly when you are not using it and make power changes to reflect that?' That's when we thought of the light in the fridge. It only comes on when you need it. PecoBOO turns your computer display into the 'light in the fridge'." Hopton outlines the company's overall approach eco-power management (EPM) tech: "EPM is designed to take control of your IT energy usage at every level. The first four stages of EPM are built right into the box and are taken care of at the manufacturing stage." VeryPC has now added what it calls "a fifth stage to EPM" which relates to the software control via PecoBOO, which they think is "comfortable and non-intrusive because it will never turn your screen off when you are looking at it. "On top of that, it will save 5, 10, 15, however many more minutes for the users who are disciplined enough to keep their default power management running because it works as soon as you leave the computer, with no delay."